I feel like I was supposed to show you guys something today but I've forgotten what it was. ._. Oh, and by the way, there is a Disqus thread at the bottom below the comment section. I initially made this thread available for non-CF-ers, yes, but also because I wanted people to use it like a 'forum' for general discussions and theories. So to see if anyone wants to give it a shot, I will post something and you guys can reply to it if you feel like it. :) Have fun! Hmm, so Cain has problems with mages? XD Sleepwalking out of the cave, out the manubar circle... so he can get mauled by Luna-bears. Sounds like a plan! Omigosh now that you have said that I cannot unsee it XDDD Dangit, Cici!! I don't think it's that bad. But I'd probably not build a pathway like that. We've heard the turm "Silver Mage" a few times, but I'm not sure if that's been explained yet. I wonder why he became a White Mage... Was it because his bro was a Silver? Edit: lol at Cain refusing to explain his feeling to his bro when he said close to the same thing to Kylie and she did explain in the end. So that's what Cain was so jealous of. Is silver like a super high rank? ...are werewolves related to the Danrir? Woah reverse family drama from now. D: I wonder what happened in Abel's mind...we've got an idea of what happened to Cain but ahh this is troubling. 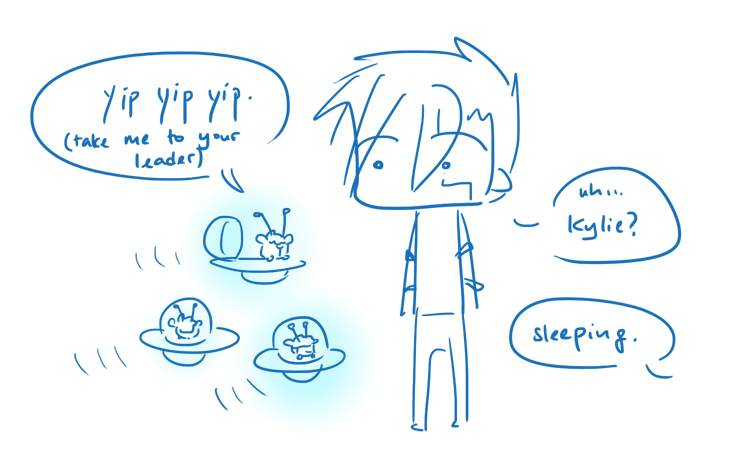 Rufi, if they can't even sleep the whole night without being ambushed then no, it doesn't count as a rest. Think of your poor, sleep deprived characters. ...Then again, it's not like Cain gets any proper sleep anyway. But yes, neither Cain nor Kylie get a lot of sleep in general. XD; They are both too plagued with random things at night. Speaking of plagues, are these more cocos coming at them? Some day there must be a drawing of this. It would probably be one of the high points of everyone's life. ...Your wish is my command. XD I love this so very much! Can I adopt one? Hm... Seems to me as if Cain was suffering of a severe case of "inferior, un-(less? )loved older brother". You know, the one parents increasingly like to call "the disappointment". And yes, that can definitely escalate into murder. Especially among families of high prominence. That doesn't excuse it, but it makes it understandable. That and to the comic above. It's basically my theory at this point. o_O Does that stuff glow blue? It should be interesting to see where things go from here. Mmhmm. :) This flashback took place maybe a year before he gets banished I believe. I'll be filling in blanks more and more in this chapter, or at least, I'm going to try. XD; What with all the characters attempting to kill each other though it might be difficult to get some talky-talky in there. Welp. But thanks Outlaw! :D I hope it will be interesting! Did I never comment here? SHeesh, Serpy!! !